Let the collections at Panstwowe Muzeum Auschwitz-Birkenau and Lost Souls Alley capture your imagination. Do some cultural sightseeing at Wieliczka Salt Mine and Main Market Square. The adventure continues: wander the streets of Stare Miasto, contemplate in the serene atmosphere at St. Mary's Basilica, have fun at Shooting in Krakow - Cracow Shooting Academy - Strzelnica Krakow, and step into the grandiose world of Wawel Royal Castle. To find other places to visit, reviews, and tourist information, read our Krakow day trip planning app . Recife, Brazil to Krakow is an approximately 16-hour flight. The time zone difference when traveling from Recife to Krakow is 4 hours. Prepare for cooler weather when traveling from Recife in December: high temperatures in Krakow hover around 5°C and lows are around -2°C. Finish your sightseeing early on the 12th (Thu) so you can travel to St. Petersburg. Museum-lovers will appreciate Saint Isaac's Cathedral and Russian Museum of Ethnography. Your cultural itinerary includes sights like The State Hermitage Museum and The Peterhof Museum of Playing Cards. There's still lots to do: see the interesting displays at Russian Museum, take in the architecture and atmosphere at Church of the Savior on Spilled Blood, admire the masterpieces at Russian Lefthander Microminiature Museum, and take an in-depth tour of Peterhof Grand Palace. To see maps, traveler tips, more things to do, and more tourist information, go to the St. Petersburg visit planner. You can fly from Krakow to St. Petersburg in 7.5 hours. Other options are to do a combination of train and flight; or drive. The time zone difference when traveling from Krakow to St. Petersburg is 2 hours. Traveling from Krakow in December, expect nights in St. Petersburg to be about the same, around -3°C, while days are a bit cooler, around 1°C. Finish up your sightseeing early on the 15th (Sun) so you can travel to Budapest. Museum-lovers will appreciate House of Terror Museum and Hungarian National Gallery (Magyar Nemzeti Galeria). Satisfy your inner culture vulture at Fisherman's Bastion and Matthias Church. There's much more to do: contemplate in the serene atmosphere at St. Stephen's Basilica (Szent Istvan Bazilika), pause for some photo ops at Hősök tere, wander the streets of Andrassy Avenue, and admire the landmark architecture of Dohány Street Synagogue. For reviews, more things to do, photos, and other tourist information, go to the Budapest trip itinerary tool . Traveling by flight from St. Petersburg to Budapest takes 6.5 hours. Alternatively, you can drive; or take a train. Traveling from St. Petersburg to Budapest, you'll gain 2 hours due to the time zone difference. Expect somewhat warmer weather when traveling from St. Petersburg in December: highs in Budapest hover around 5°C, while lows dip to -1°C. 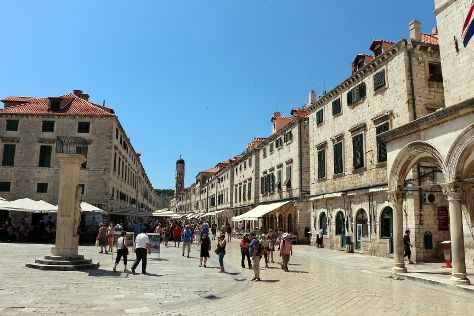 Finish your sightseeing early on the 18th (Wed) so you can travel to Dubrovnik. Start off your visit on the 19th (Thu): appreciate the extensive heritage of Walls of Dubrovnik and then wander the streets of Old Town. Get ready for a full day of sightseeing on the next day: step off the mainland to explore Island of Lokrum, get engrossed in the history at Franciscan Monastery, then examine the collection at War Photo Limited, and finally get engrossed in the history at Rector's Palace. To find maps, traveler tips, other places to visit, and more tourist information, use the Dubrovnik travel itinerary planner. Fly from Budapest to Dubrovnik in 6.5 hours. Alternatively, you can do a combination of shuttle and flight; or drive. Plan for a bit warmer temperatures traveling from Budapest in December, with highs in Dubrovnik at 15°C and lows at 6°C. Finish your sightseeing early on the 20th (Fri) so you can travel to Prague. Start off your visit on the 21st (Sat): take in the views from Charles Bridge, take in the architecture and atmosphere at St. Vitus Cathedral, then get to know the fascinating history of Prague Castle, and finally take a stroll through Old Town Square. On your second day here, take a stroll through Mala strana, take some stellar pictures from Prague Astronomical Clock, then contemplate in the serene atmosphere at Spanish Synagogue, and finally take an in-depth tour of Jewish Museum in Prague. For more things to do, reviews, where to stay, and more tourist information, read our Prague day trip planning app . Fly from Dubrovnik to Prague in 5.5 hours. Alternatively, you can do a combination of bus and flight; or drive. Traveling from Dubrovnik in December, expect Prague to be little chillier, temps between 5°C and 0°C. You will have some time to spend on the 23rd (Mon) before leaving for home.